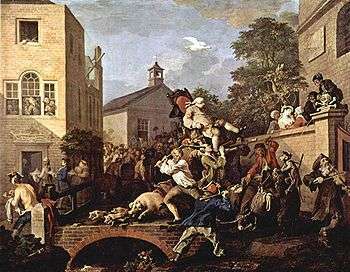 The Humours of an Election is a series of four oil paintings and later engravings by William Hogarth that illustrate the election of a member of parliament in Oxfordshire in 1754. The oil paintings were created in 1755. 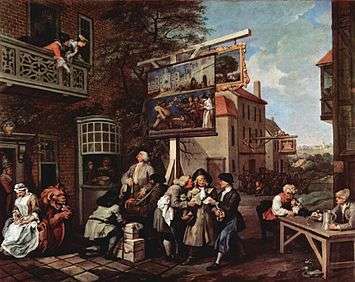 The first three paintings, An Election Entertainment, Canvassing for Votes and The Polling, demonstrate the corruption endemic in parliamentary elections in the 18th century, before the Great Reform Act. 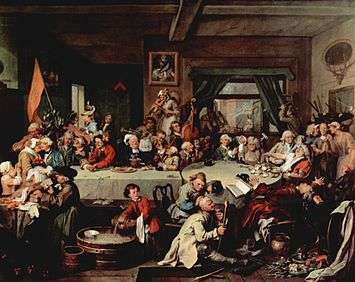 The last painting, Chairing the Member, shows the celebrations of the victorious Tory candidates and their supporters. The originals are held by Sir John Soane's Museum, London. 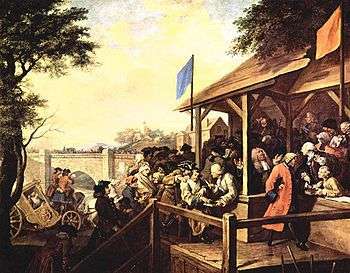 The painting depicts a tavern dinner organised by the Whig candidates, while the Tories protest outside. The Tories are carrying an antisemitic caricature of a Jew, a reference to recent legislation passed by the Whig government which allowed greater freedom to Jews. A banner containing the words "Give us our Eleven days", a protest against the adoption of the Gregorian calendar, which was carried by the Tories, is on the tavern floor. In the tavern the two Whig candidates are ingratiating themselves with supporters. One candidate is kissing an ugly pregnant woman; the other is listening to a drunken bore. At the other end of the table the Mayor is collapsing from over indulgence in oysters, while the Election Agent is knocked out by a brick thrown through the window by the Tory mob. Other supporters throw furniture at the Tories. The composition of the scene parodies traditional images of the Last Supper and other Biblical feasts. This scene depicts Tory and Whig agents, both attempting to bribe an innkeeper to vote for them. The crowd outside the tavern is visible in the background. In a reference to the antisemitism of the crowd behind, a Jewish peddler is being employed by another agent who is offering jewels and ribbons to the wives of voters. Voters are shown declaring their support for the Whigs (orange) or Tories (blue). Agents from both sides are using unscrupulous tactics to increase their votes or challenge opposing voters. A Whig voter with a hook instead of his amputated hand is being challenged because he is placing his hook, rather than his hand, as legally prescribed, on the book. One of the victorious Tory candidates is being carried through the streets on a chair in a traditional ceremony. He is about to tumble down because one of his carriers has just been accidentally hit on the head by a flail carried by a Tory-supporting rural labourer who is attempting to fight off a Whig supporter (an old sailor with a bear).